In an effort to fix the intermittent power drop I was taking the carbs off to give them a clean and ensure no debris was obstructing the floats. When I removed the carbs I found there was some fuel sitting in the intake passages. A Google around unearthed a reference to a possible culprit - the o-rings in the choke mechanism. The theory was that the o-rings around this were perished and allowed fuel to seep through. As I also had the original poppet butterfly valves rather than the solid discs, I'd also been advised to replace these to ensure easier adjustment later when the poppet valves would eventually fail, allowing too much air into the carbs. 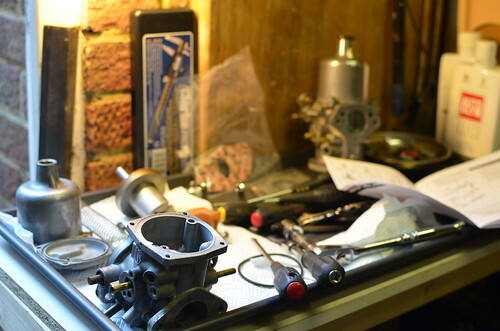 This called for a rebuilt kit from Burlen which whilst quite pricey would ensure that the carbs would be one thing to rule out form the list of possible culprits if it did not fix the problem. The strip down and rebuild was not overly difficult, but a few more diagrams about orientation of various seals would have been useful, especially where the originals were worn. I think the hardest thing was adjusting the seals around the spindles and ensuring their fitment did not impede the operation of the valves. Oh and getting the new butterfly discs to seal fully in the intake channels.